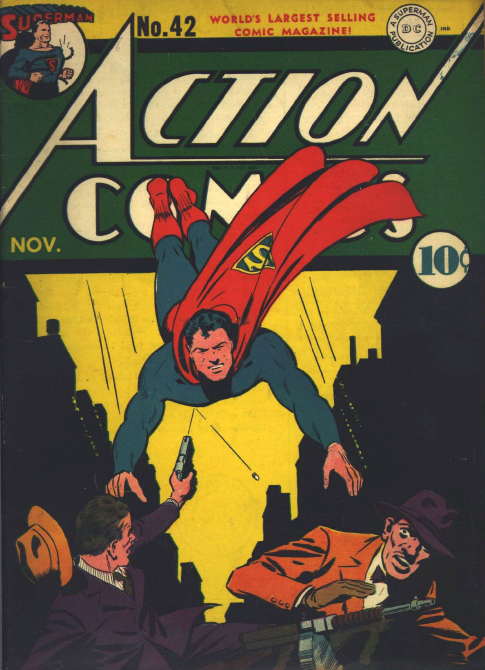 A fairly generic Superman cover for Action 42 (Nov. 41). 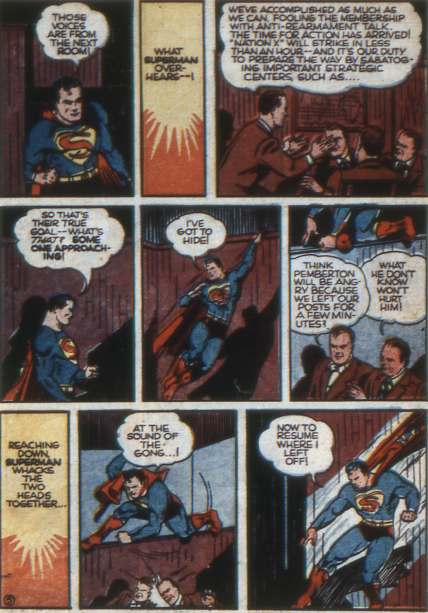 Jerry Siegel and Leo Nowak provide a very non-generic story for Superman on the inside. 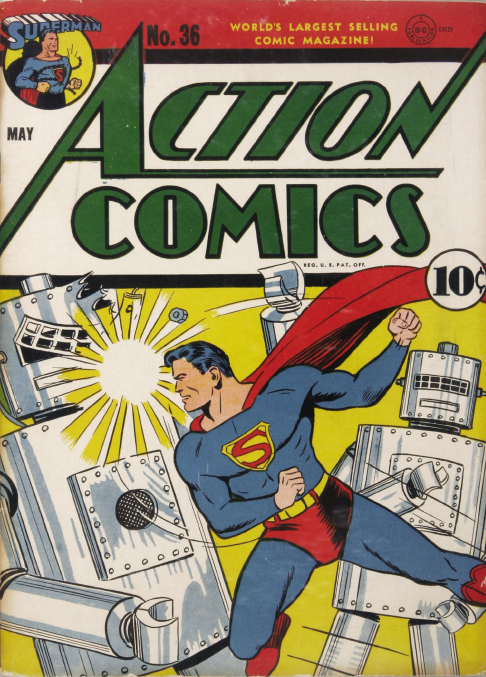 A number of prominent men go missing in Metropolis, which Clark covers for the Daily Planet. 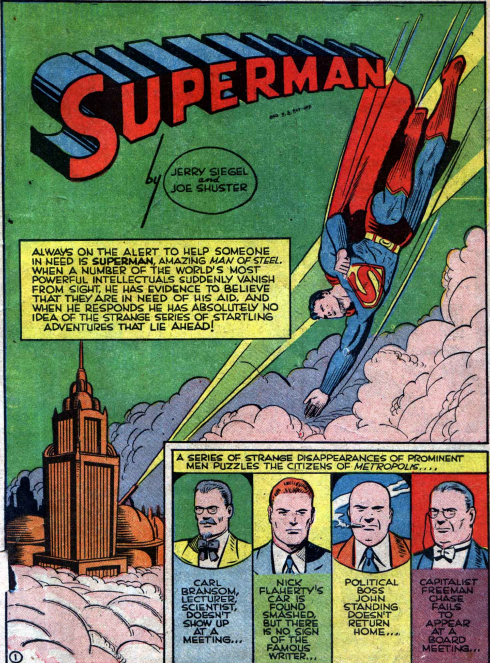 Perry White approves of the series, and Jimmy Olsen makes a small cameo. 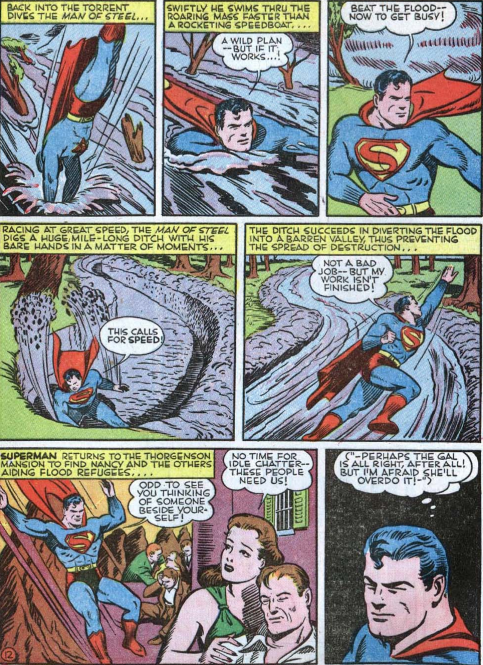 Superman has some theories as to who is behind the kidnappings, but the trail keeps ending when his suspects keep getting killed by beams coming down from the sky. Sergeant Casey is also on the case, with no idea what is going on. 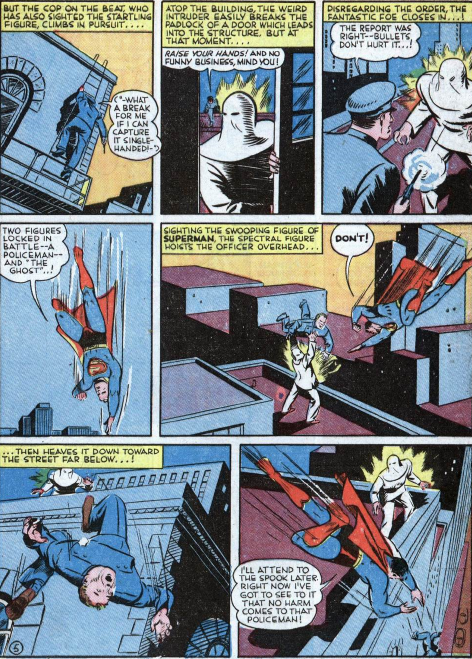 Things only start to move towards an explanation when Clark Kent gets grabbed, and taken up to a city floating high in the stratosphere, ruled by an alien, Zytal. 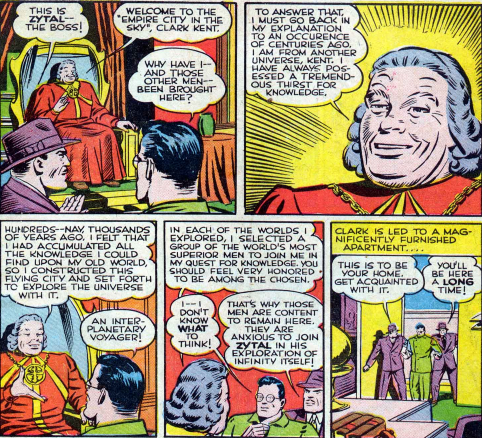 Clark’s articles made him worthy of being collected. 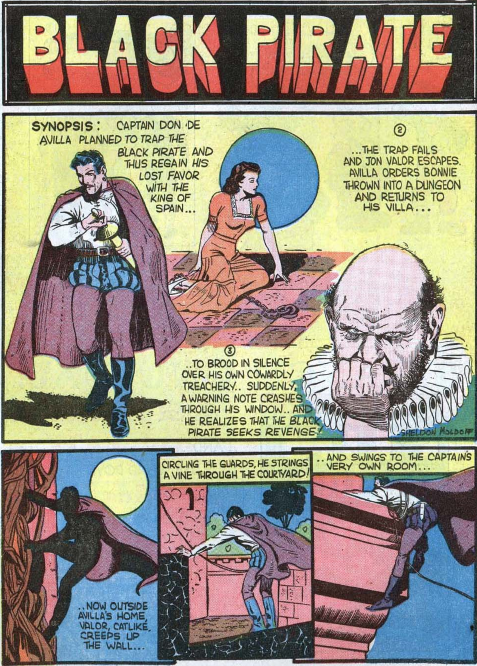 Zytal’s intention of collecting people from different worlds in a search for knowledge vaguely resembles Brainiac’s motivation, many years down the road. But Zytal is really Luthor in disguise. 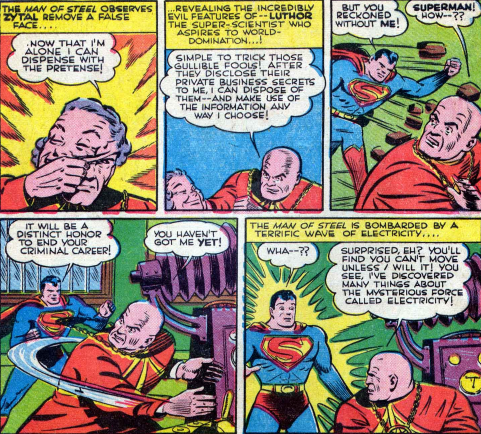 He manages to use electricity to not only paralyze Superman, but also put him under Luthor’s mental control for a while. This is when he puts Lois in danger. Cause Lois always has to be in danger at some point in the tale. 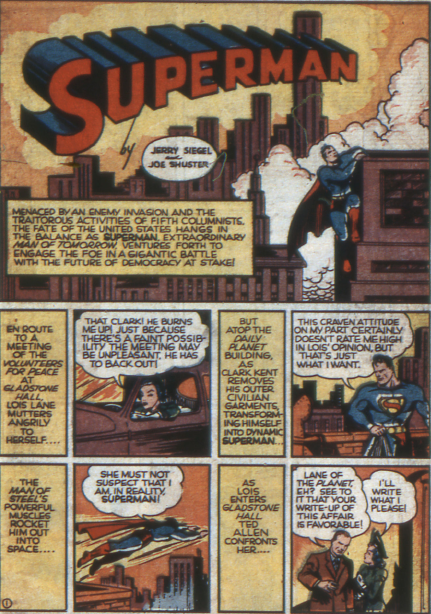 Superman breaks free, and rescues the people from the city, although Luthor seemingly jumps to his death. 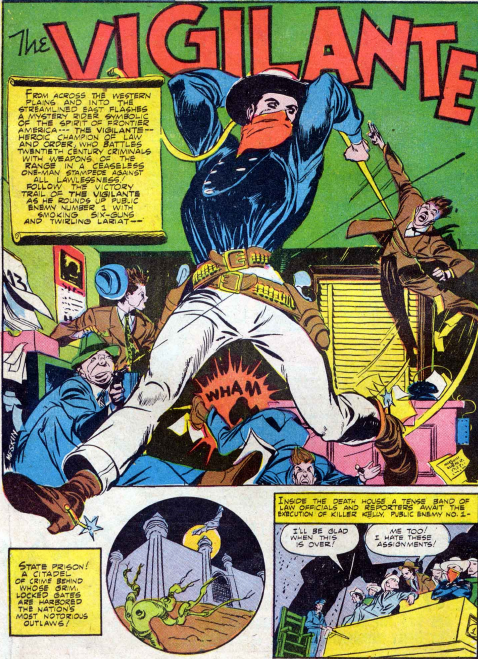 Mort Weisinger and Mort Meskin introduce a really successful blend of the western and superhero genres in this issue, with the Vigilante. A modern day cowboy who fights crime in the big city, his first case centres on a supposedly executed felon, whose death was faked. 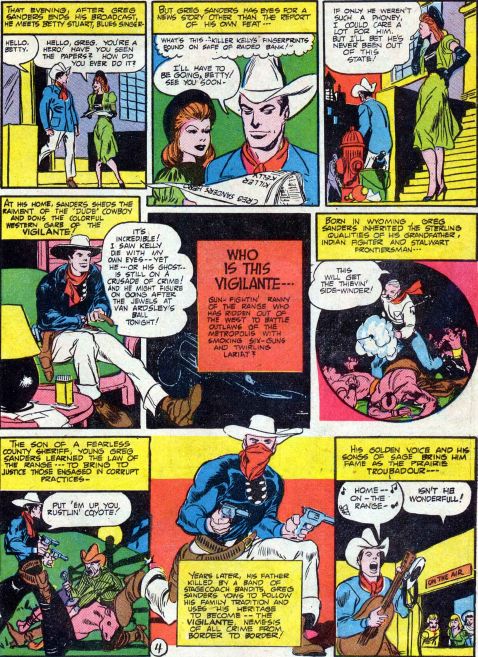 Vigilante’s origin is covered briefly. Greg Sanders was the soon of a sheriff, who taught him gunslinging and gave him his taste for justice. After his father was murdered, Greg adopted the guise of the masked Vigilante. In his everyday life, he is a country music singer. Meskin’s art is extremely dynamic, and the story is fun to read. 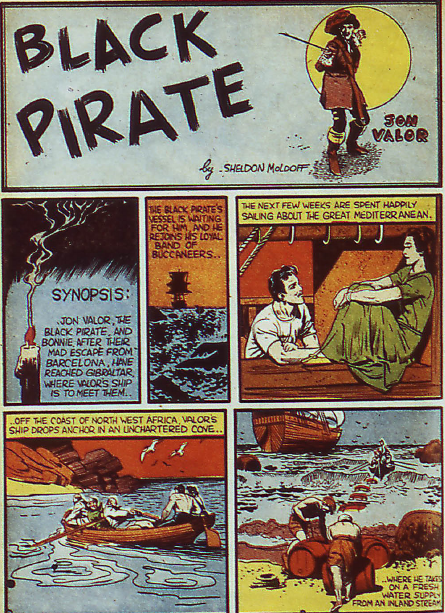 Sheldon Moldoff ends the Black Pirate’s run in Action with a really quick, but mediocre tale. 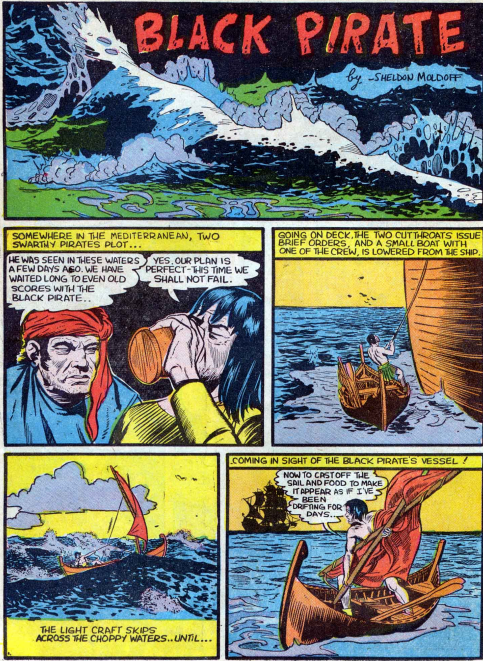 Jon spots a man adrift, and takes him on board, though Bonnie harbours doubts about him. Once again, Bonnie is dead on, as the man is working with others to take over Valor’s ship. 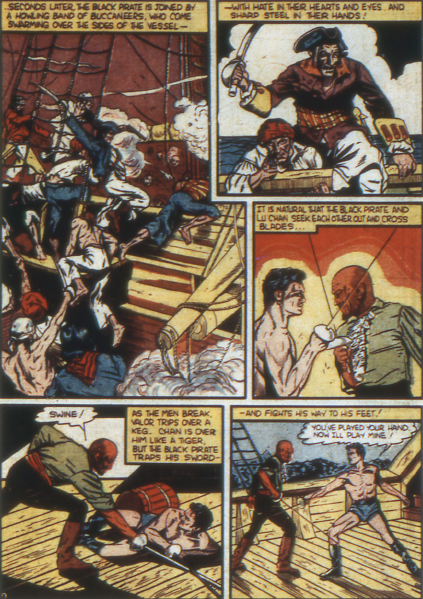 The Black Pirate defeats him. From here, the series moves over to join the starting line-up on the new Sensation Comics. Sidekicks are popular, right? 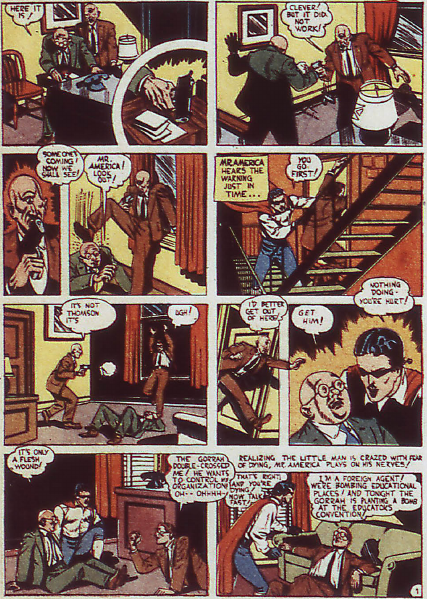 So the Mr America series could only be improved by introducing a sidekick, right? 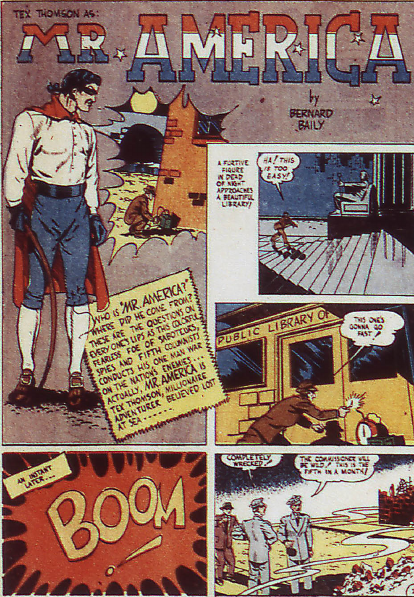 In this story, by Ken Fitch and Bernard Baily, Bob Daley decides to take on a masked identity of his own. 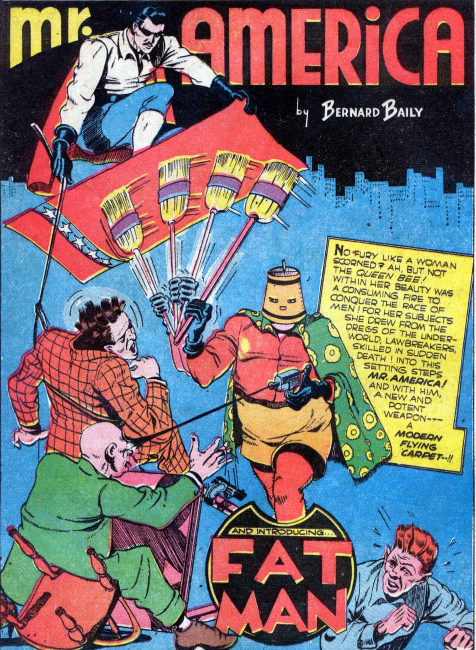 He puts on long red underwear and a lampshade on his head, and armed with a broom and a squirt gun of ink, takes to the streets as Fat Man. 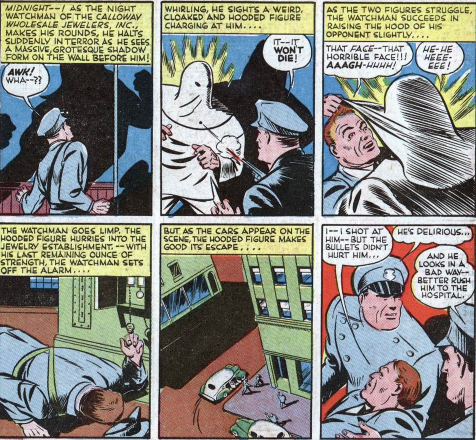 Tex has no idea of Fat Man’s identity at first, he has been busy in his secret cabin/laboratory in the woods making his cape function as a flying carpet. 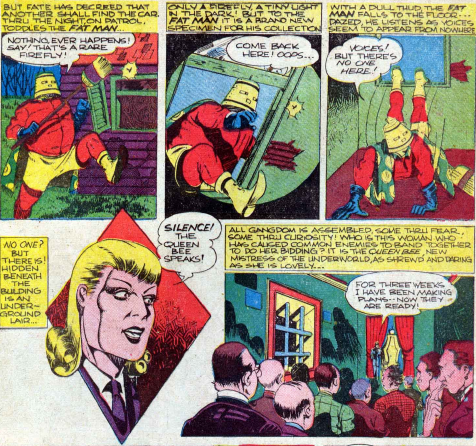 Together they face the Queen Bee, the first of many DC villainesses to use that name. The Queen Bee returns later in the run. So does Fat Man. Sadly. 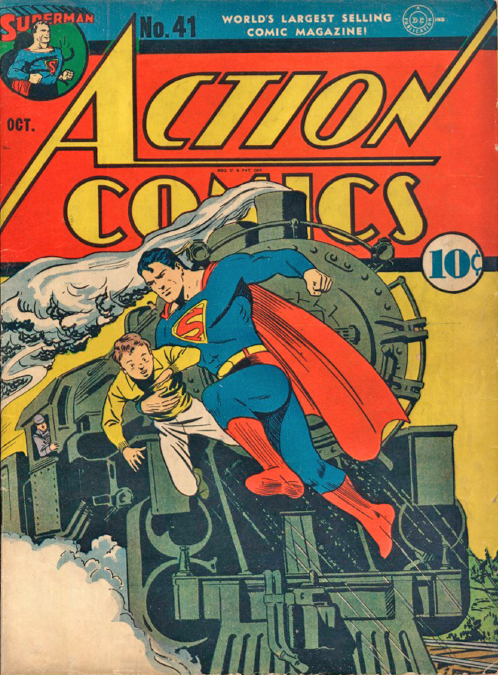 Very nice cover for Action 41 (Oct. 41). I like the puff of steam at the side of the train, helps convey forward motion. I can’t draw for the life of me, and spotting those kind of “tricks” always impresses me. 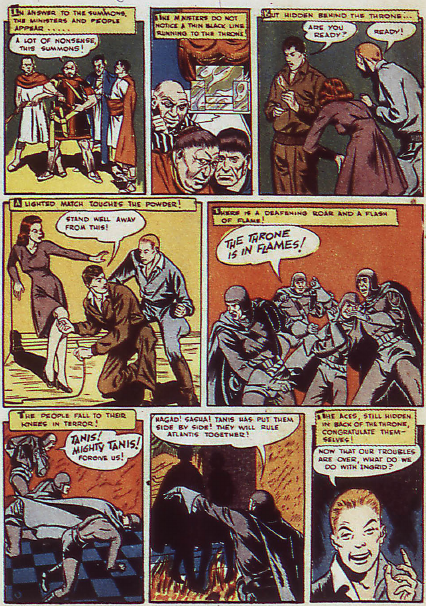 Jerry Siegel and Paul Cassidy turn out another story about foreign saboteurs in this issue. The politics and motivation of those behind it are kept muddy, though. Sergeant Casey is featured again. He is no longer hunting Superman, and they are buddies again. 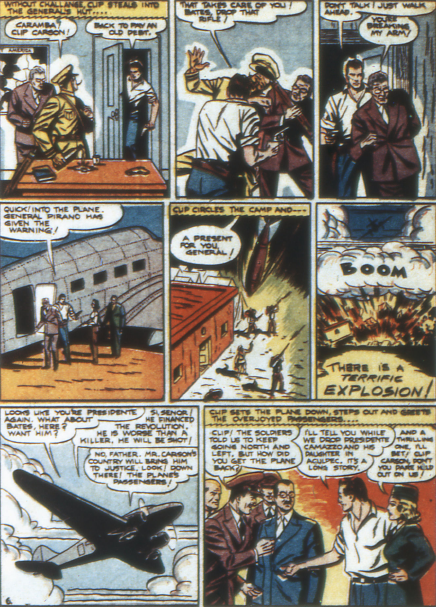 Casey tracks down the man who planted the bomb which began the tale, and Superman winds up having to protect him, while tracking down his boss, who is trying to have him killed. 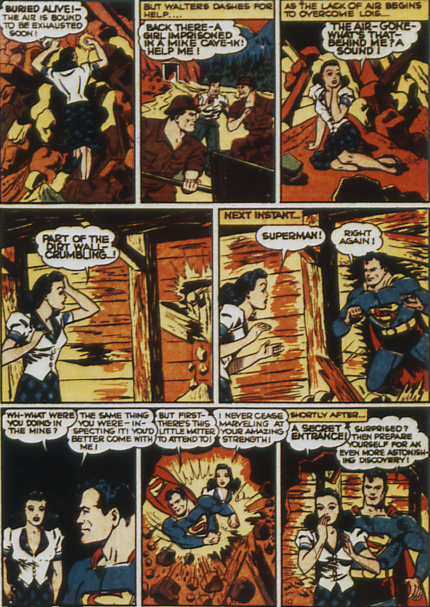 Lois Lane gets captured, and must be saved, but the whole sequence is so quick it seems almost jammed in because it “had” to be there. Pep Morgan’s series comes to a close with this issue, which follows from the previous story. 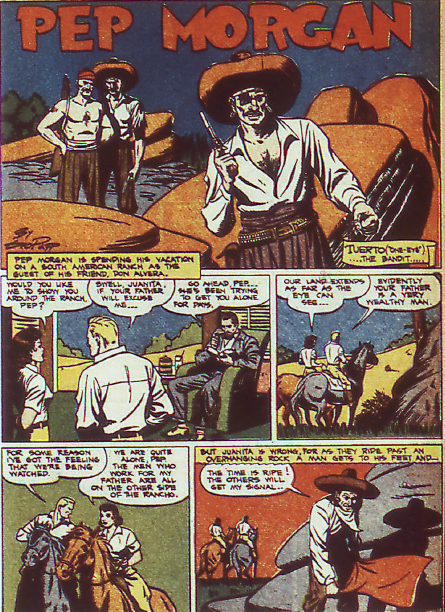 Don Alvera brings him to his ranch in the country, where Pep is pitted against the local bandit king, Tuerto, whom he kills. Don Alvera seems to actively be trying to set up Pep with his daughter, though Pep’s first comments to her are about her father’s wealth. The last we see of Pep he is embracing the prone Juanita, as her father Don Alversa looks on approvingly. After his failed gay relationship, his failed professional baseball career, and his many failed attempts at college, Pep settles down in Chileanos, becoming the muscle behind the powers the run the country. And after marrying Juanita, and becoming heir to Don Alvera, Pep was sure to rule like a warlord. I imagine, in the end, Pep was unable to accept the frailties of age, and attempted some fight or daring act when his body was no longer capable of it, and died stupidly. 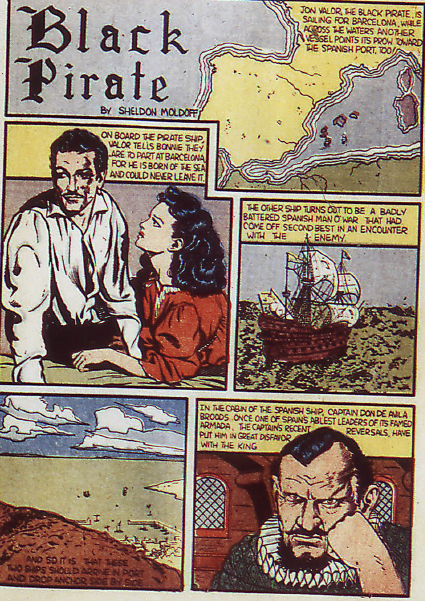 The Black Pirate is given a one-issue tale by Moldoff in this issue, which seems derived from Haggard’s novel She. 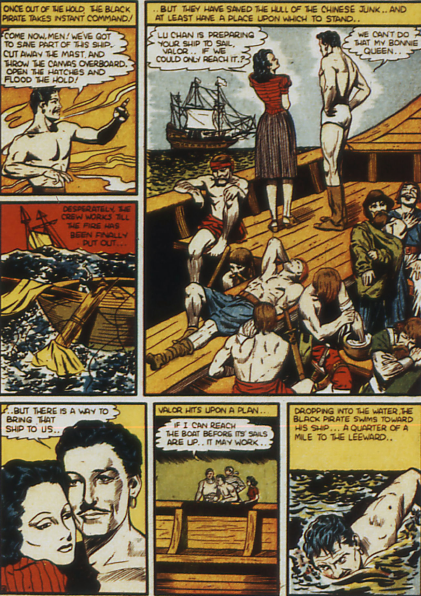 Jon docks the ship, and goes ashore, discovering an albino “goddess,” and her giant black slave. He doesn’t have time to do much more than break a jar and run back to his ship. He decides to forget about the adventure, and never tell anyone about it. If it wasn’t for Moldoff’s art, I probably would have forgotten about it, too. 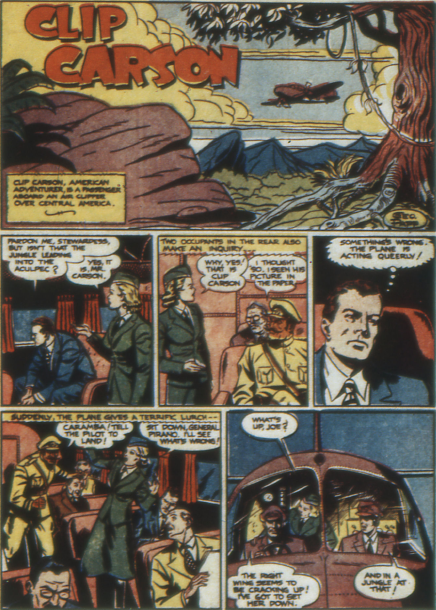 I probably should have written about Congo Bill’s adventure in the previous issue, as it introduced Sheila Hanlen, who continues as a supporting character. The story was a silly one, though, about finding a valley of dinosaurs. 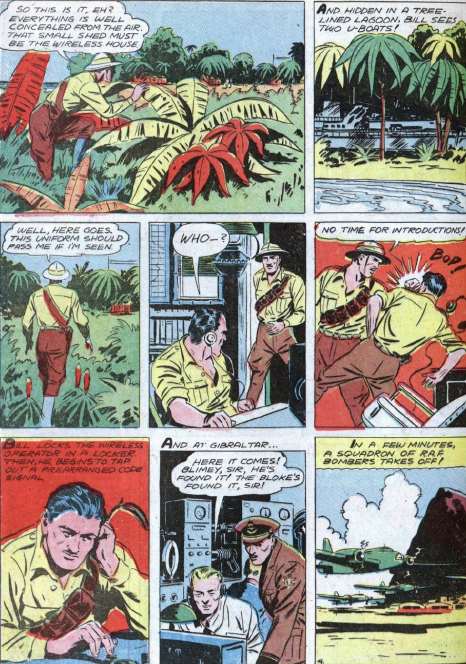 I guarantee it is not going to be the only story in which Congo Bill finds dinosaurs, and I’m sure there are better versions than the one by Fred Ray. But Sheila is back in this story anyway, which deals with World War 2 again. 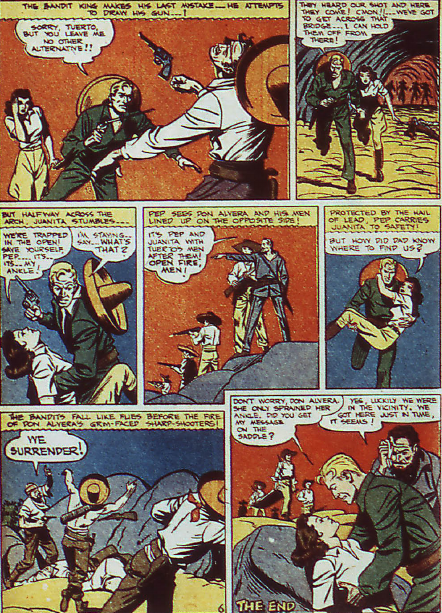 Congo Bill and Professor Kent, along with Sheila, return to a British fort, and discover that a German agent is trying to rouse the natives against the British. 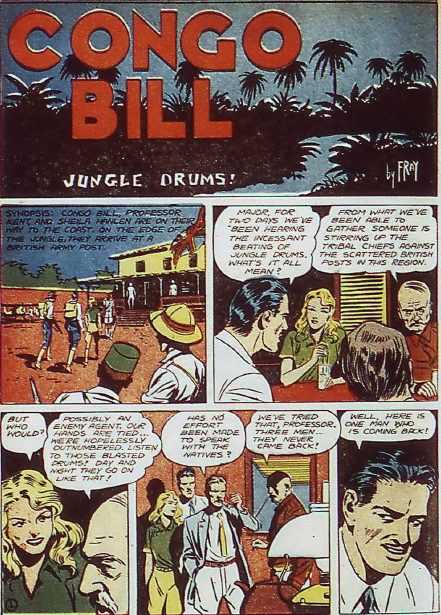 Bill goes out to fight the man, as apparently the natives will follow whoever wins. It’s kind of insulting, really, and ignores the huge reasons the Africans had for not siding with their alien overlords. 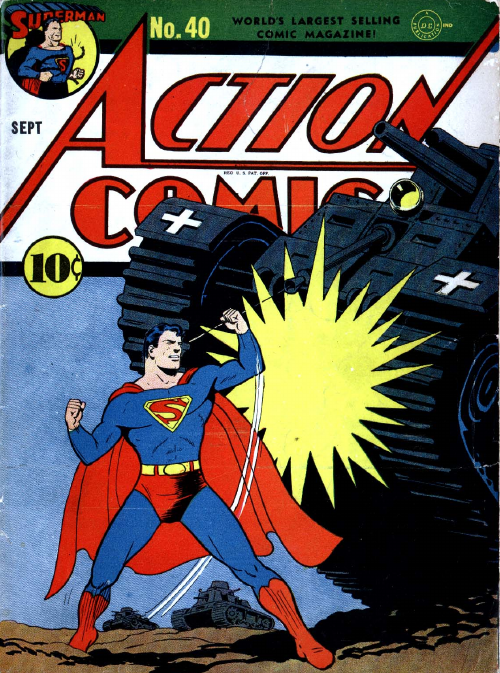 Interesting markings on the tank on the cover of Action 40 (Sept. 41). They’re just crosses, but somehow manage to convey another symbol quite effectively. 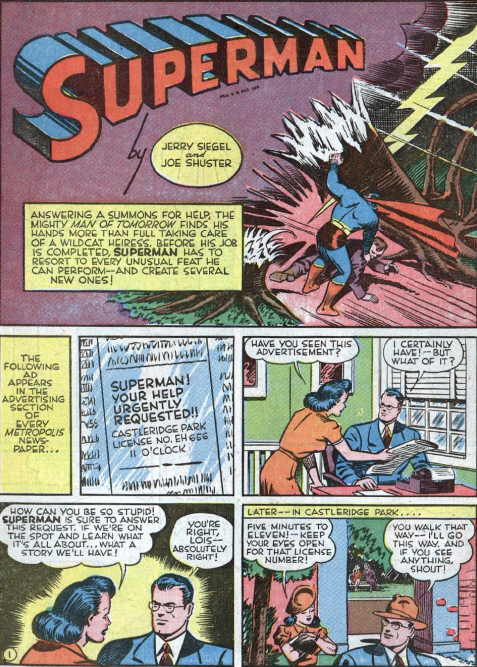 Jerry Siegel and John Sikela contribute this little story, in which a millionaire enlists Superman’s help in reforming his party animal daughter. 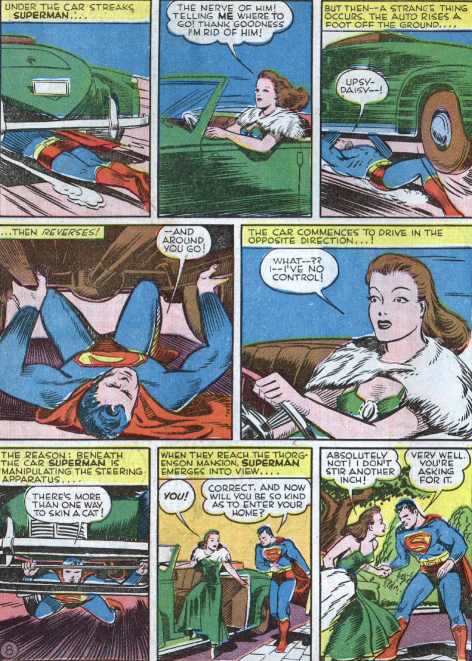 Lois has a small role, trying to lay in wait for Superman and find out what the secret meeting is all about. 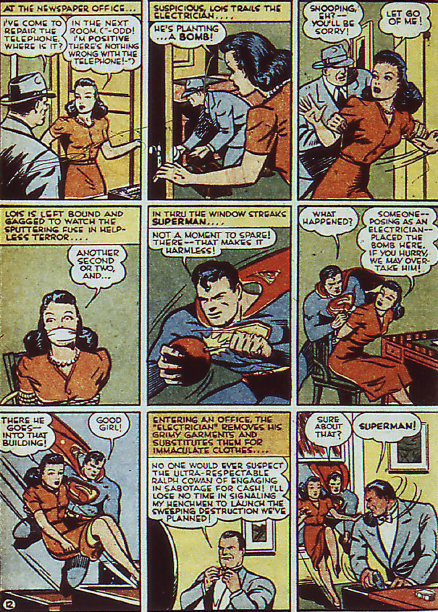 But she gets Clark to go with her, scuppering her own plans. The story is pleasantly diverting, but with little to it. The girl appears to be a spoiled brat. 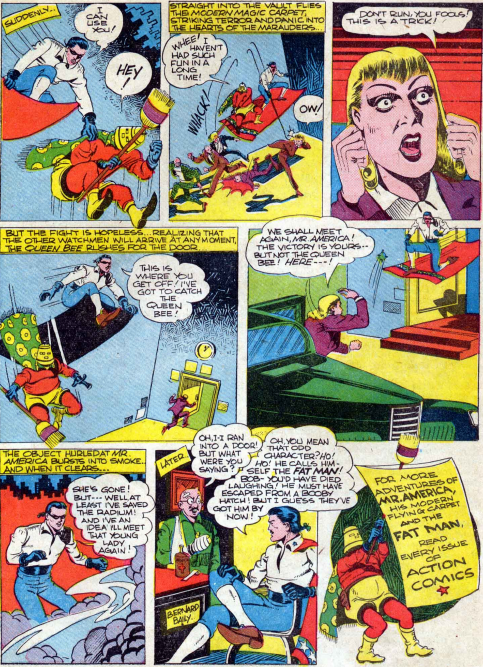 Superman prevents a crooked casino from taking her money, and stops her from eloping with a young wastrel. Towards the end of the story a dam bursts, for no particular reason. The girl winds up helping the victims of the flood, which makes her re-evaluate her life. Pep Morgan is out of school, and looking for work, in this George Papp story. The text tells us that this is summer vacation, but Pep must have already had seven or eight summer vacations during his run. How many years has he spent in college? Pep winds up taking another bodyguard job, this time for Don Alvera, from the South American country of Chileanos, who has come to the US to sell diamonds on behalf of the government. Impressed with Pep, Don Alvera beings him back to Chileanos, just in time for Pep to rescue the president of the country from being kidnapped. 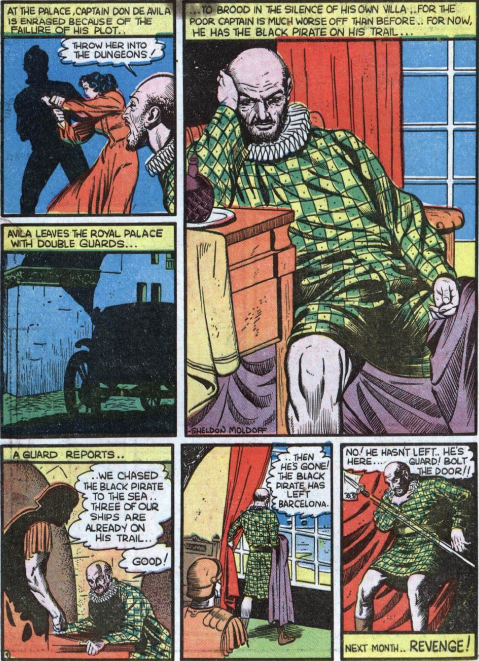 Moldoff wraps up the Don De Avila storyline in this issue. 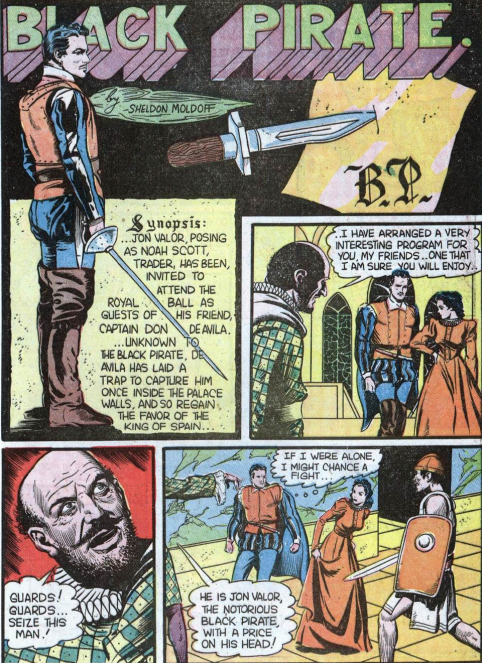 Jon Valor waits until De Avila’s men have gone out hunting for him, then sneaks back into the castle and confronts his traitorous former friend. They duel, though you get the feeling De Avila has given up before the swords are even raised. And he dies. 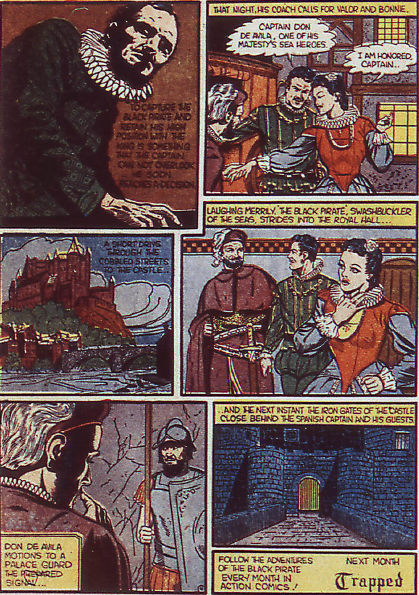 The Black Pirate then frees Bonnie from the cell she had been imprisoned in. 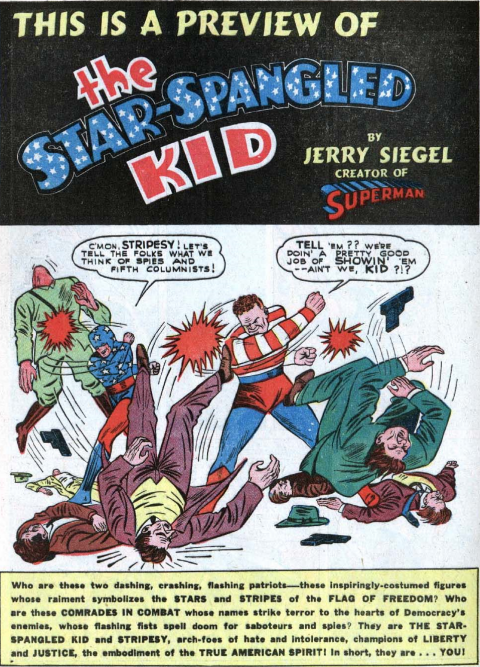 This issue also includes a three page preview of the Star-Spangled Kid and Stripesy, shortly to headline the forthcoming Star-Spangled Comics. 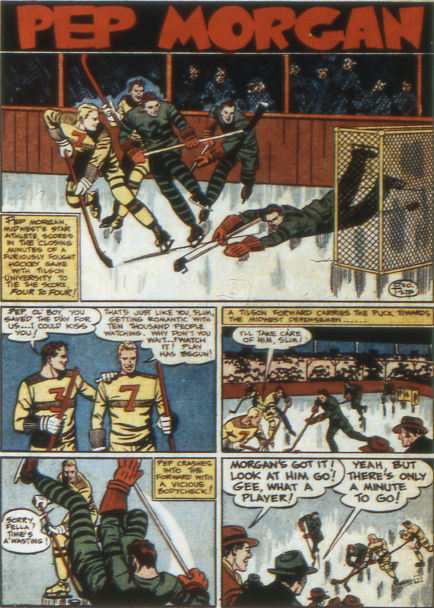 The pair were created by Superman scribe Jerry Siegel (which explains why the preview was in this book), and Howard Sherman. 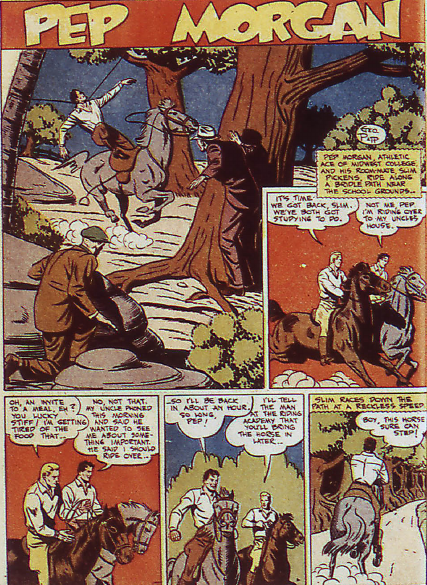 This marks their debut, although they don’t do much other than introduce themselves, both in their heroic identities, and out of them, as wealthy young Sylvester Pemberton, and his chauffeur Pat Dugan. Neither had any powers. The unique thing about this team is that the boy was main hero, and the adult the sidekick. 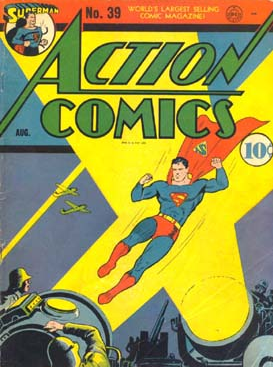 Another militaristic cover for Action 39 (Aug. 41). 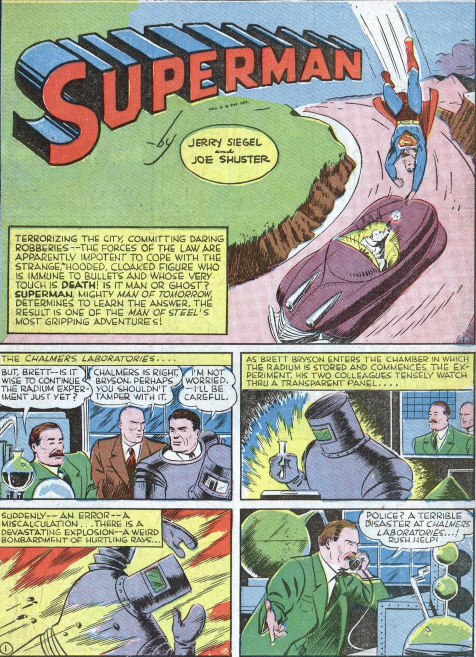 Jerry Siegel and Leo Nowak craft a decent tale, pitting Superman against a radioactive murderer. The story is also a mystery, as the killer is believed to be a scientist who died in a laboratory explosion. Did the radiation bring him back from the dead? 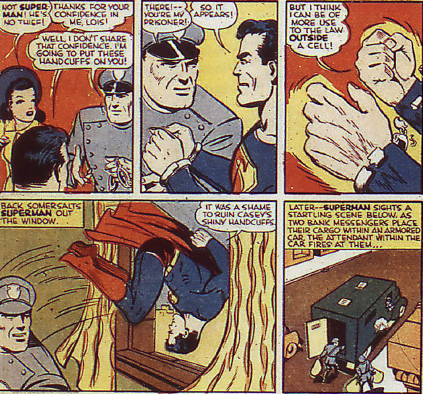 Superman is still having troubles with the police. He does his best to save a cop from being killed by the radioactive man, but winds up getting blamed for the murder himself. Sergeant Casey is once again out to get him. 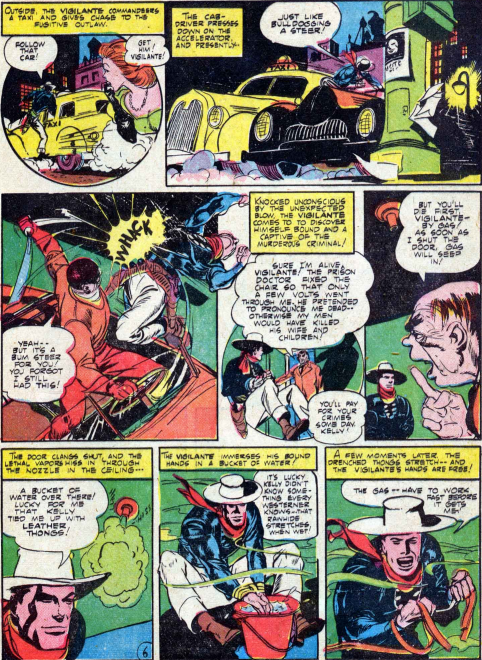 This has a more Batman-like solution, with the dead man not really dead, and the whole explosion part of an elaborate decoy in the murder scheme. Pep Morgan is abruptly attending Midwest University in this George Papp story. No word on what made him leave Midtown, and Slim is nowhere to be seen. Those two facts must be connected somehow. Curious that the kidnapping made them break up. 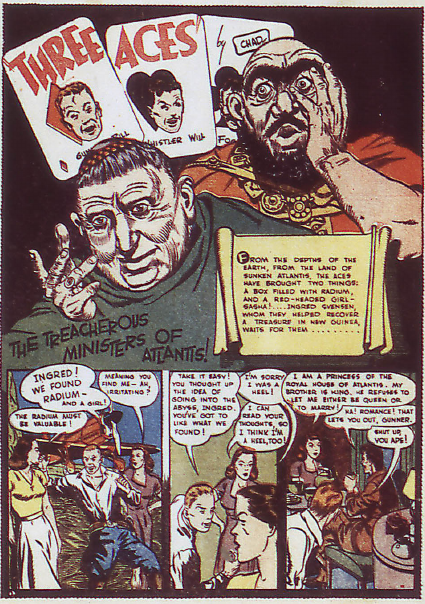 But a few issues earlier, there had been a story in which Slim’s gambling debts set off the problems. Was the kidnapping a fake, intended to get money from Slim’s uncle? It seems to me to be a reasonable conclusion, as I apparently have no faith in human nature. And Pep ruined Slim’s plans, while at the same time Pep learned that his beloved Slim was not to be trusted. So off Pep goes to another university, and once again winds up framed by gamblers who want to fix the game. Pep winds up disguising himself as a bum to make it back to the field. As has happened before, the story ends with the coach putting Pep back on the team, but this is the last Pep Morgan story to have a school setting, and I think he simply left under a cloud. 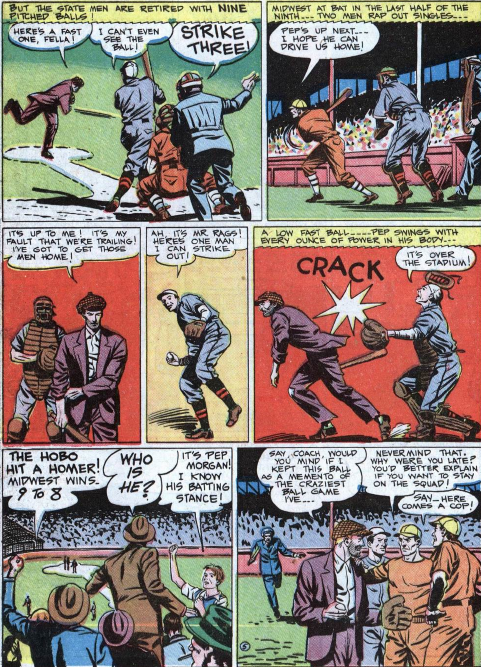 Sheldon Moldoff continues the Black Pirate’s reunion with Don De Avila in this story. Bonnie’s suspicions about the man prove correct. They don’t even reach the banquet table before De Avila orders Jon Valor arrested. 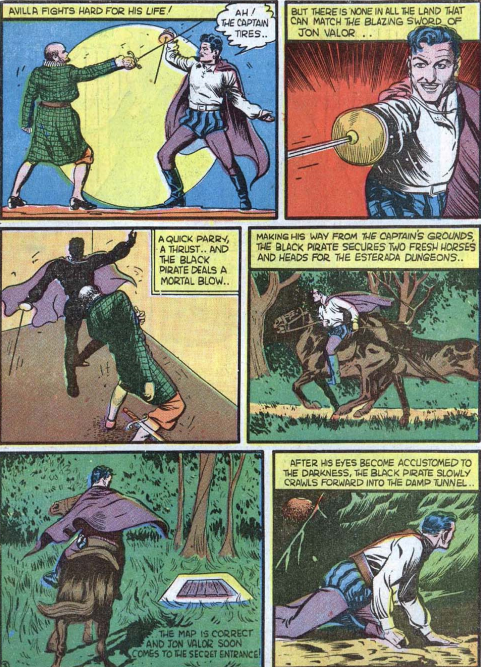 The Black Pirate manages to escape the castle, but Bonnie is held captive. This is no victory at all for De Avila, who has lost a friend and gained an enemy, and it’s done nothing to restore his place at court. Fred Ray pushes neutrality to the limit in this month’s Congo Bill story. 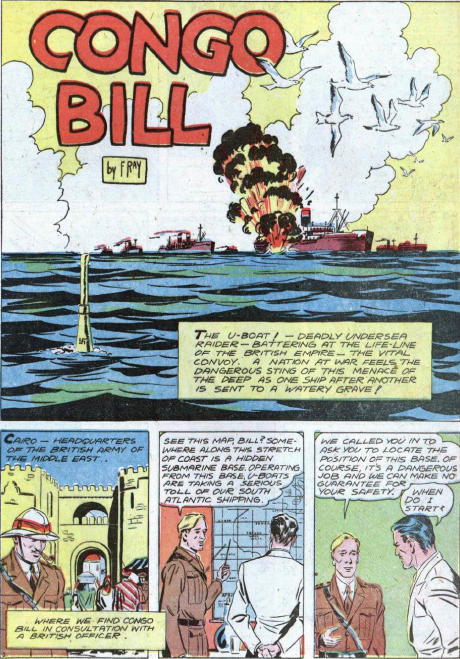 Bill is in Cairo, working with the British, who ask him to help patrol the coast for u-boats, as he is more familiar with the territory. That’s an amazing realistic and logical opening to a story. While the word “Nazi” does not appear in this story, and the country menacing north Africa is never named, the use of the term “u-boat,” as well as the fact that the evil army address each other as “herr” makes things pretty clear. A Hitler moustache is even used on one of the characters. Congo Bill finds the invaders, and sends them packing in short order. 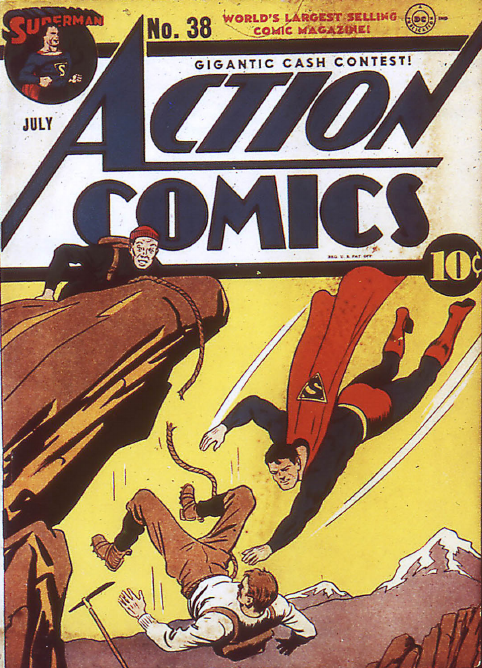 Lots of stories to talk about in Action 38 (July 1941), so I’m not even going to banter about the cover. 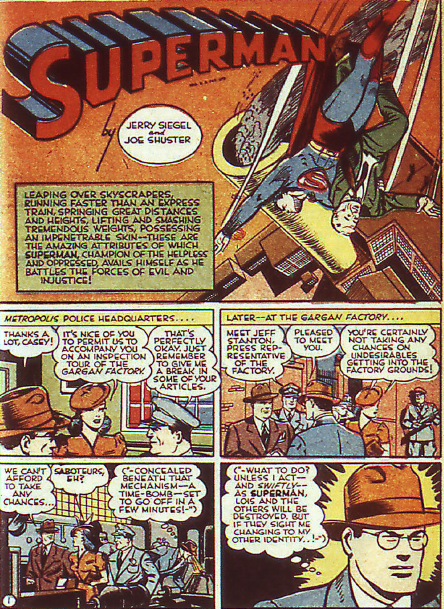 Jerry Siegel, Leo Nowak and Ed Dobrotka dish out a Superman story that gives Sergeant Casey a run for his money. People are committing crimes with no memory of having done so. The police are run ragged, and have no idea what is behind the rash of thefts. 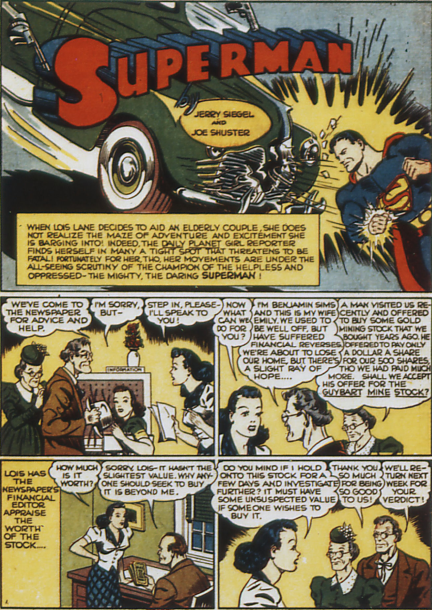 Sergeant Casey and Lois Lane get locked in a bank vault, and though Superman rescues them, his presence at so many crimes scenes prompts Casey to arrest him – or at least try to. 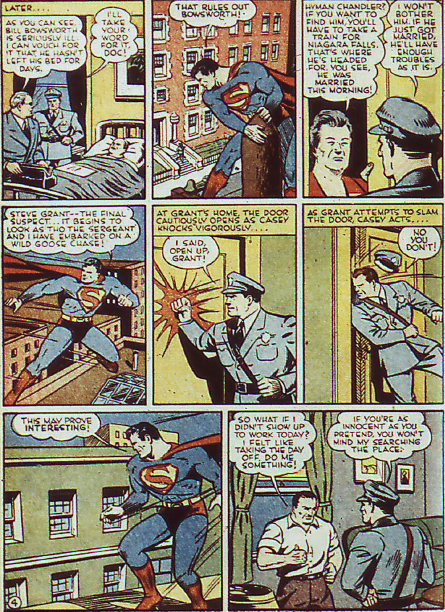 Superman gets away, but then Casey decides that Clark Kent must be behind it, following similar reasoning. 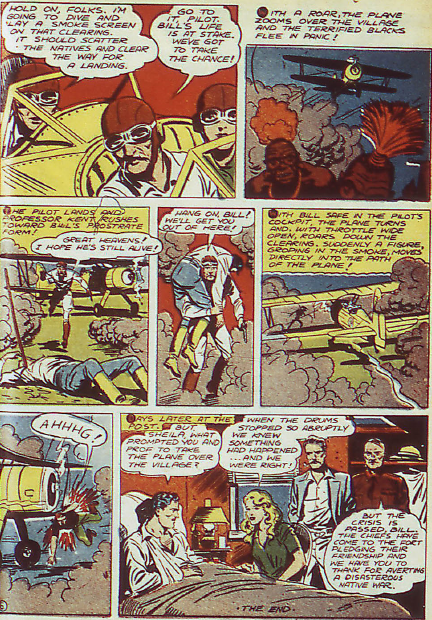 Although not named, Jimmy Olsen cameos in one panel, looking more like himself. 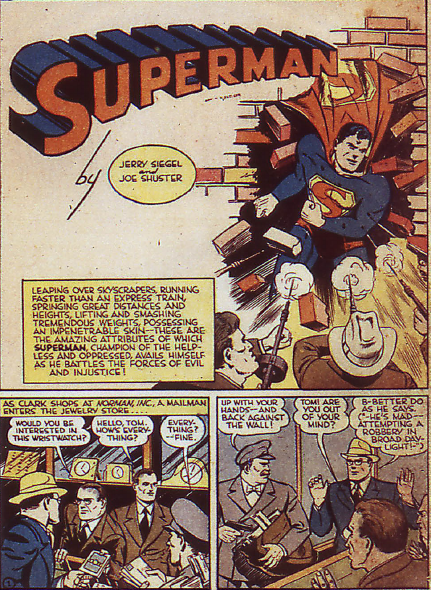 Both as Clark and Superman, our hero must evade the police, until he figures out that the man behind it all is using radio waves to take over people’s minds. 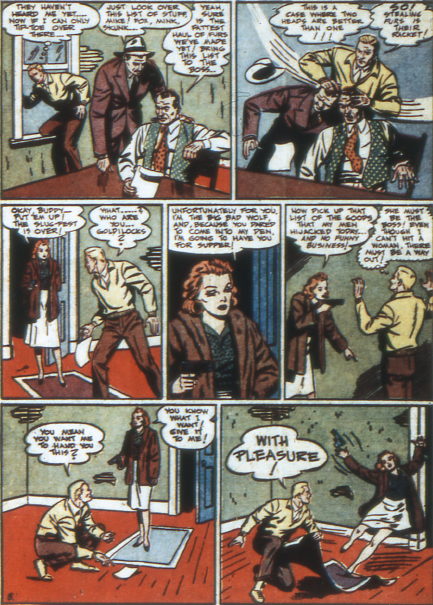 George Papp puts Pep Morgan through the ringer in this story, when Slim gets kidnapped. 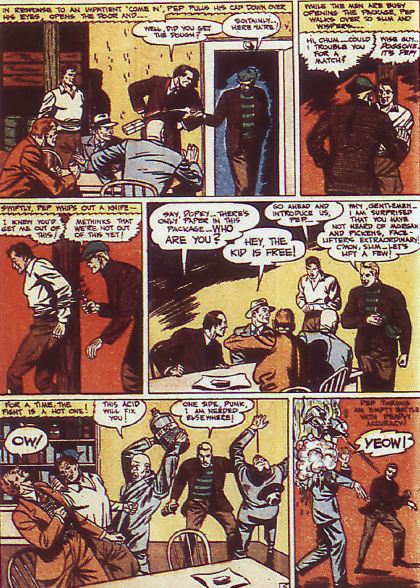 His wealthy uncle whines about not having the cash on hand to pay the ransom, so Pep decides to fake out the kidnappers and rescue his friend himself. Pep succeeds, and is reunited with Slim. The final panel shows them back in their college dorm, happily bantering. Aww. After skipping last issue (because of a boring Atlantic crossing), Jon Valor lands to rest and restock before continuing on to Barcelona. Docked alongside him is the ship of Don De Avila, an old friend of the Black Pirate, who has fallen out of favour with the crown. Don and Jon are happy to run into each other, and De Avila invites his friend to a banquet that night. 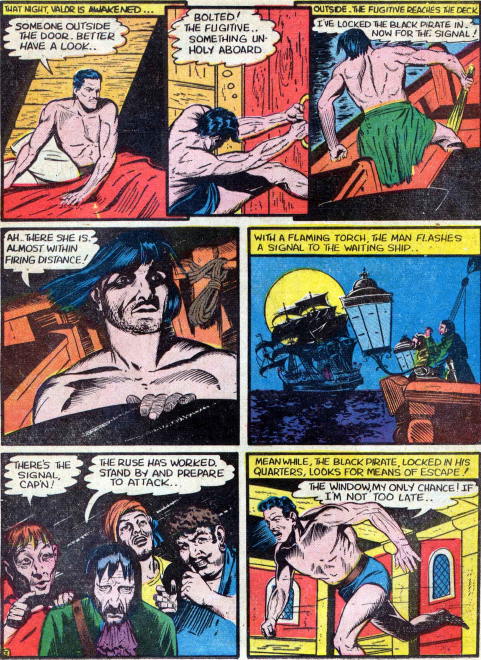 Bonnie has misgivings, fearing that De Avila intends to imprison the Black Pirate, and turn him over for the reward, but Jon trusts in his friend. Nicely ominous ending, the walls of the castle. The story continues in the next issue. The Three Aces continue their trip into Atlantis in this story. It reminds me a bit of Jack and the Beanstalk. Our heroes steal radium from the underground city, attack its leaders and leave the palace in ruins. Hurrah! Some triumph. 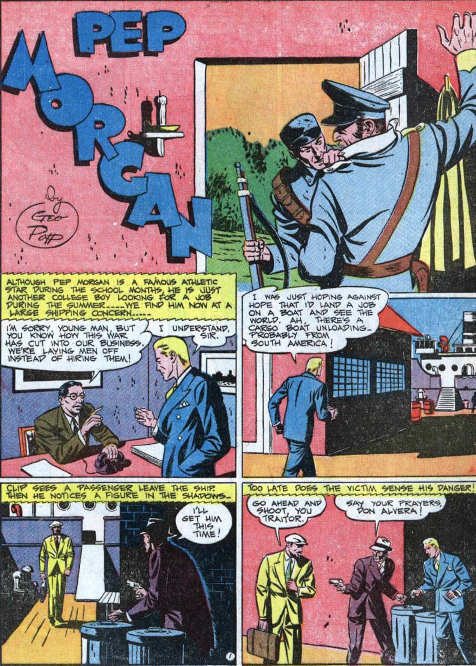 Although the Mr America series pits Tex largely against spies and saboteurs right now, the Gorrah makes his final appearance in this issue, working with Nazi agents, in this story by Ken Fitch and Bernard Baily. The Gorrah betrays them in the end, preferring to pursue his goal of vengeance over their plot against the army. 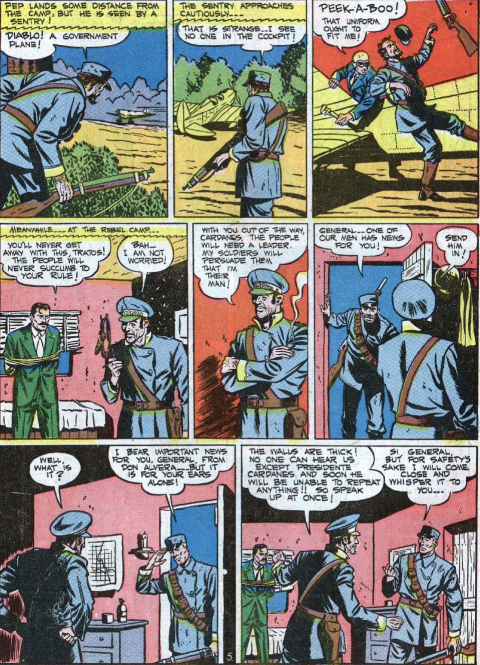 At first Gorrah believes Tex to have died, and is out to kill Bob, but he learns the truth, and the identity of Mr. America, just before perishing in the explosion intended for a educator’s convention. It’s really odd to see the one-eyed character dressed in an ordinary suit. 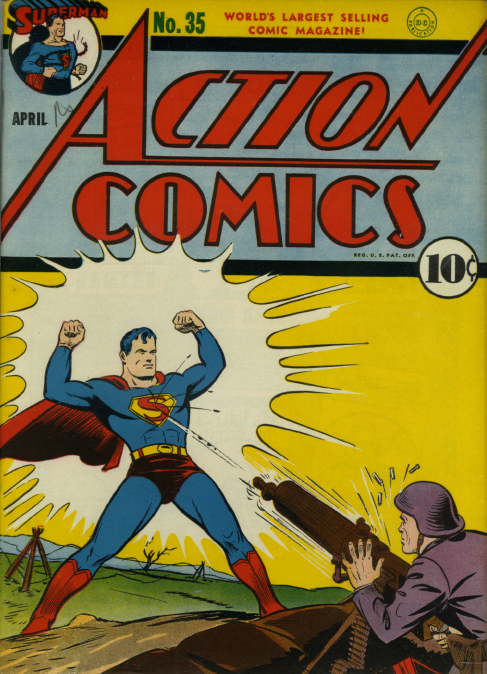 Action 35 (April 1941) has the first of a number of militaristic covers on the book this year. But strict neutrality is maintained, the attacking armies are never identified. 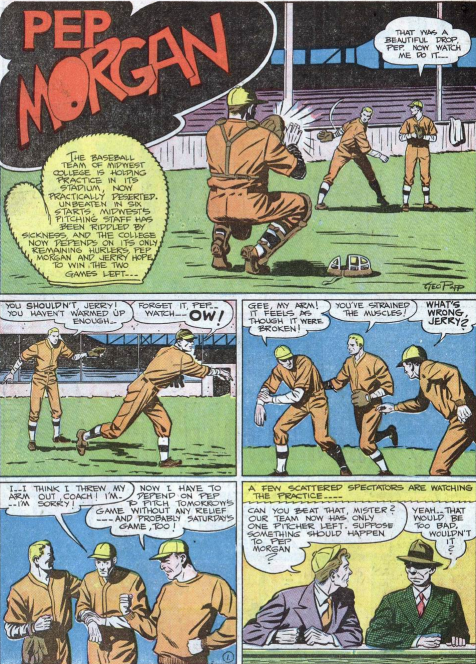 Jerry Siegel is joined by Wayne Boring and Don Komisarow on the art, as Lois Lane investigates a worthless gold mine, the stock of which is being bought up, even if the owners have to be forced to sell. It’s the third story in a row to deal with natural resources, following the coal mine last issue, and the lumber camp before that. 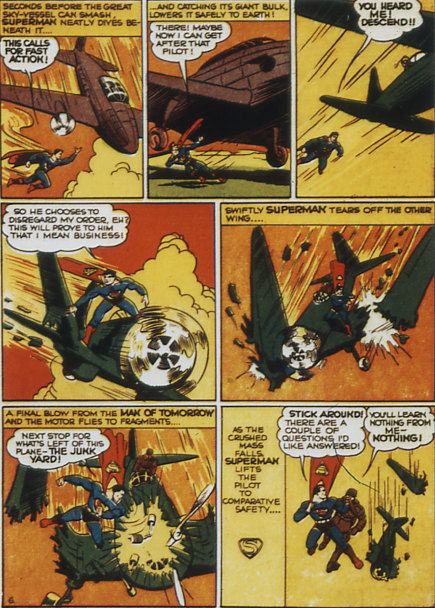 Superman is clearly flying in this issue. No amount of leaps or streaks could explain the control over direction and speed that he demonstrates. So far as I have been able to determine, there was never a specific story in which his ability to fly was revealed, as there were with so many of his other powers. It was simply a natural outgrowth of what was being shown on the page. The story is a bit more complex than the last two, with the worthless mine being used to store stolen gold, and the shares bought up to ensure no one came around. 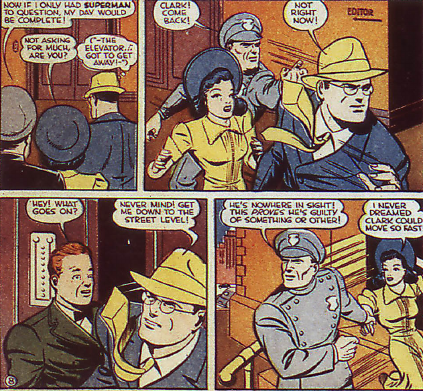 But mostly it’s Lois Lane getting into trouble and needing to be rescued by Superman. Jon Valor is stuck in his tighty whiteys in this Black Pirate chapter, by Moldoff. 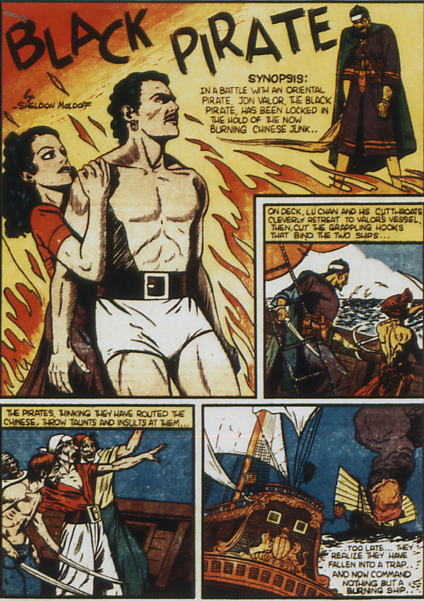 The Black Pirate does manage to put out the fire consuming the junk, but the Asian crew has taken over his ship in the meantime. The Queen of the Seas is finally given a real name in this issue, Bonnie. She doesn’t get to do much. 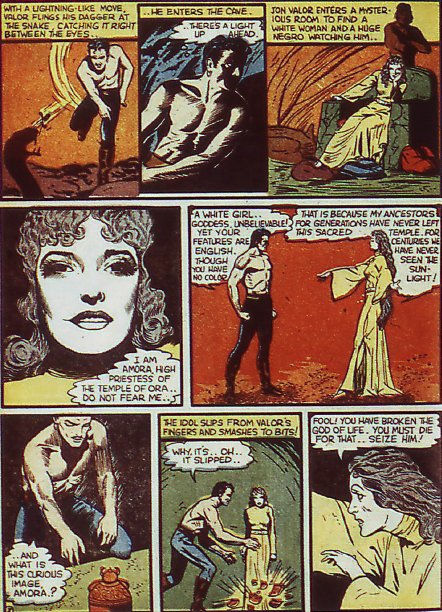 After seeming so tough in her debut, the character has quickly degenerated to the clinging romantic interest. 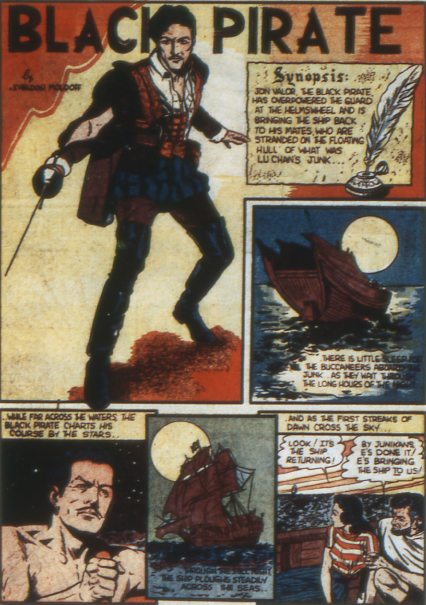 The Black Pirate swims out to take his ship back that night. He sneaks aboard and kills the man at the wheel, steering the ship back towards his men.